The present Cape Lookout Lighthouse was built in 1859 on the south end of Core Banks Island and presents a 156 foot focal plane above sea level. It replaced an earlier 100 foot tower that was built in 1812. The earlier tower with it’s weak light was deemed to small to offer much assistance to mariners trying to avoid the cape’s offshore shoals known as the “Horrible Headland." At the beginning of the Civil War Confederate troops retreating from Fort Macon shot out the lens, putting the light out of operation till it was relighted in 1863. In 1873 the lighthouse was painted it’s distinctive black and white diamond pattern to make it a better daytime mark. In 1967 the light station replaced it’s Fresnel lens by automating the station with a airport style beacon that flashes white every fifteen seconds. The white flash can be seen from as far away as twenty five miles. 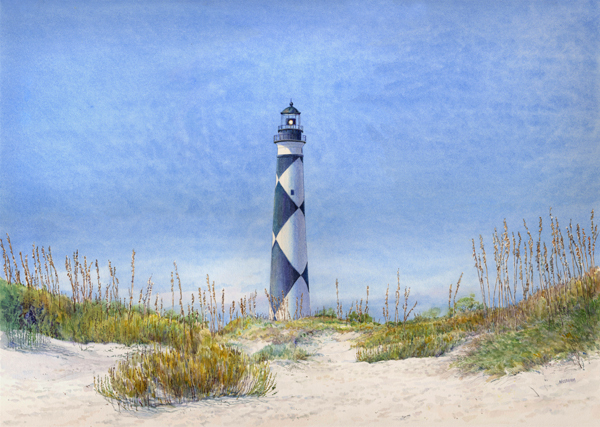 Now part of Cape Lookout National Seashore, the Cape Lookout Lighthouse can only be reached by taking a passenger ferry out of Harker Island to Core Banks Island. The trip by ferry takes about twenty five minutes and is well worth it.